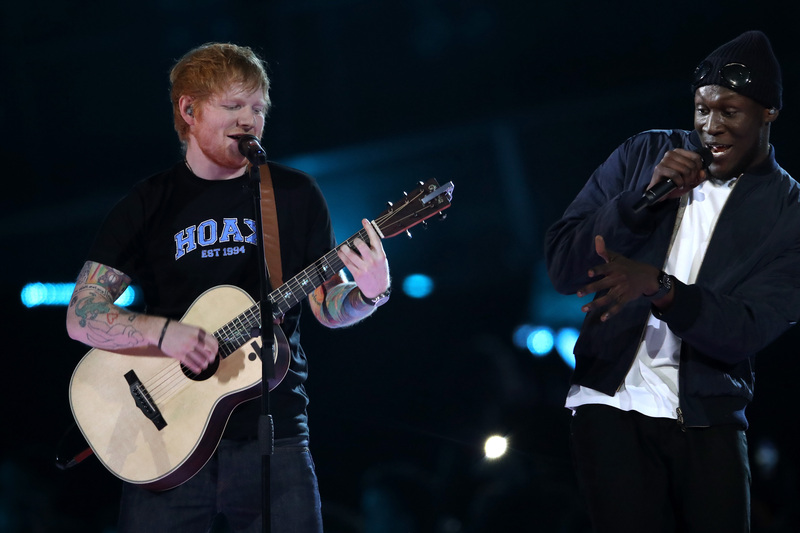 Ed Sheeran has teamed up with Stormzy once again, to sing an incredible version of Shape Of You as part of his homecoming tour and it seriously went off. After their remixed version of Ed’s new hit single went down an absolute storm – sorry – at the BRIT awards earlier this year, you might not think they’d be able to top it. Yet somehow, last night, I think they actually managed it and the audience seemed to agree. Stormzy was in the middle of his third sold out gig at London’s O2 Academy Brixton, when he welcomed his new best mate Ed, to the stage to sing alongside him and what a performance it was, the NME reports. Before Ed cheerfully jumped on stage, Stormzy did a classic self-deprecating speech by saying ‘I’m a very sh*t singer but I’ll give it a go,’ just as they were about to launch into their second rendition of the year. The flame-haired singer wasn’t the only one to share the stage with Stormzy last night though, as major grime artist Ghetts also joined him to really get the crowd going. Stormzy is currently on his homecoming residency tour for his hugely, well-received new album, Gangs, Signs and Prayers released in February this year. Stormzy just keeps getting bigger and bigger and just when you think he might be reaching the top of his game, he pulls something else out of the bag. Here’s to a few more Stormzy and Ed appearances in the future, this man can do no wrong and we can’t get enough.